This is Day X of our 31 Days of Less & More challenge. To read all the posts in order, start with Day 1, then visit the Overview Page to see the entire series. The thoughts come so quickly and so naturally, we often don’t even realize we are doing it. We see the supermom next to us, the one who is president of the PTO, toned and tan with gorgeous hair and glowing skin, and think why can’t I be more like her? She drives a brand new Escalade, her perfect children somehow manage to be both athletic and smart, and while you’ve never actually been to her house, you can only imagine that House Beautiful will be dropping by any day now to take photographs for their next feature. She’s so lucky. By some miracle of organization, she always, always seems to know what’s going on, and you’re quite sure she has never forgotten to sign a homework sheet, or had to swing by Publix at the last minute because she forgot to bake homemade treats for the class. Why can’t I ever seem to pull myself together? The whispers of comparison, once started, are insidious. They will eat away at our happiness, our peace, and our sense of well-being until there is nothing left but an empty feeling of inadequacy. But my friends, here is the truth: Not one of us leads a perfect life, hard as some of us may try to present that image to the world. Every single one of us has our own set of challenges, our own trials, our own pain. A wise friend once reminded me, as I was busy comparing myself to another mom who seemed so much more put together, that we all get the same 24 hours to work with each day. No one can do it all, and what gets presented to the world is often far from the whole picture. And that Supermom you’ve been comparing yourself to? Perhaps she works so hard to maintain her appearance because she is desperately insecure. Perhaps trying to present a perfect image to the world has put her family deeply in debt, and she has trouble sleeping at night as she worries they will lose their house soon. Perhaps she struggles with depression or chronic pain or a marriage on the brink of collapse. Or perhaps it is none of those things. But we never really know. 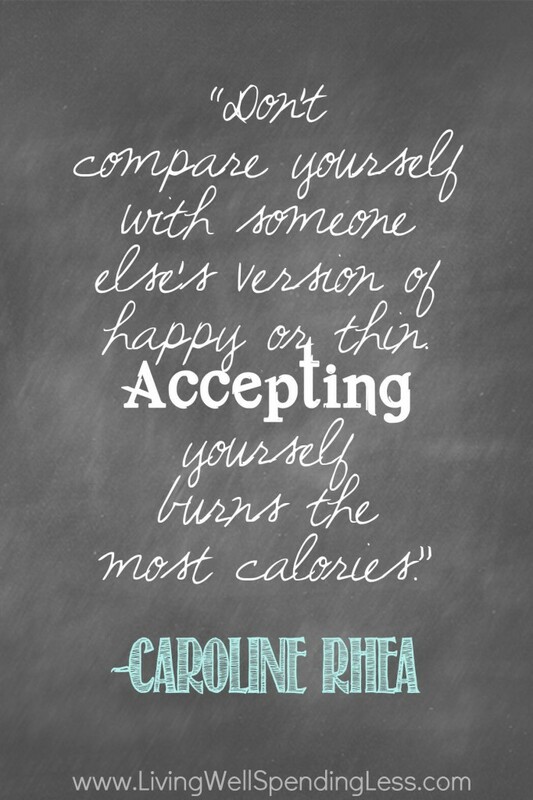 The problem with comparisons is that more often than not, what we are comparing ourselves to isn’t the full picture. The only real solution is to stop. I’m so thrilled to have my sweet friend Crystal Paine of Money Saving Mom joining our Less & More challenge this month! Be sure to check out her insightful thoughts on less bitterness & more forgiveness here! Wow Ruth, another post that I swear was written just for me! This series has been life changing already and it is only day 4. Comparing myself to others is something I know I have to work on. Thank you. Karen, I am so happy to hear that you are enjoying this series. It can be so hard to look inward at the changes we need to make in our own lives. I wish you the best this month! Thank you so much for following along. Thank you Amber. You also! What I worked my heart around to focusing on in my post was that comparing myself to HER is a waste of time. Because all those superwomen I want to be? Well, someone else is busy being her – and I need to be ME. I’ve been sharing our 31 day challenge with my husband & he’s been on board. Today we discussed on how we can stop putting out an image of “we have it together”. I’m bleessed to have a loving supportive husband. However, we sometimes struggle financially & charge up the credit cards. That’s why we found ourselves doing this 31 day challenge. So far it’s been a true blessing. Thanks! I love that you guys are doing this together! So happy to hear it has been a blessing for you so far; keep up the good work! You and Edie are really writing some good stuff for the challenge! My comparison problem is generally more in our money/lifestyle areas. I compare our financial situation with others and am envious that they can “afford” for the Mom to stay home or buy the things they buy when we can’t. I’m working on it though, thanks for sharing! Thank you Sara, I’m so glad you are enjoying the series! I can definitely relate to the money/lifestyle comparison–it is so easy to get sucked into wanting something that someone else has! So much truth here. Thank you. I love this whole series. I’m new to your blog and love it! I do tend to imagine (make up) that other moms are more put together or organized than I am and then I feel like such a mess but you’re so right, we don’t know what they are going through or what they prioritize in their life. I love the idea to pray for them…helps release my anxiety and focus on Him instead of me. What a beautiful sentiment! Love that challenge- will definitely be back to look out for your other posts. Ruth, I am amazed at the great topics of each day! There was a person in my life who hurt not only me but others close to me and I was harboring unforgiveness for YEARS toward her. The Lord convicted me of my bitterness towards this woman and I had to find some teaching (several) on just how to forgive. It seems so easy for some people to forgive, you know? The key for me was reading that forgiveness is a decision not an emotion. Wow, talk about a huge “ah-ha” moment! What I had to do was (1) pray for her (2) when bitterness would rear its ugly head, I would say out loud, “Lord, I choose to forgive her!” and (3) not gossip about her (that is easier said than done). God is good because she came to me and asked my forgiveness (much to my surprise) and I had already done that. What her apology did for me is open the door to a new and healthy relationship with her. I still continue to pray for her because I committed to do that a long time ago. I marvel at the changes I see in her. You know that saying “the grass is greener on the other side”? Well, the grass may be greener, but it still has to be mowed. We always want to compare ourselves to others, but we forget they probably worked very hard to have what they have. I have learned to be thankful for what I have, because we can lose it in a heartbeat (which we have) and there is always someone wishing they had what I have. God has been to good to me to complain about what I don’t have. That is the hardest lesson I have ever learned. Thanks for sharing!